Design Burd Inc.The Hostess with the Mostess | Design Burd Inc. In addition to website design and development, Design Burd can host and maintain your site, as well! Homebuyer's Resource Group is one of our clients who takes advantage of our hosting and maintenance offerings. 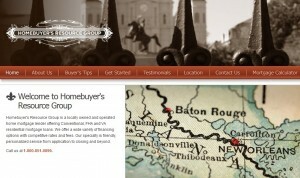 Â Located in Baton Rouge, Louisiana, the team at Homebuyer's Resource Group are always at ease, knowing that if they ever need a last minute update or encounter a problem with their site that the Design Burd crew is only a quick phone call away, and are always ready to help!